We have seen the fundamentals of impact of jets, force exerted by a jet on vertical flat plate, force exerted by a jet on stationary inclined flat plate, force exerted by a jet on stationary curved plate, force exerted by a jet on a hinged plate and force exerted by a jet on a curved plate when the plate is moving in the direction of jet in our recent post. Now we will see here the derivation of expression of force exerted by a jet of water on a series of vanes with the help of this post. Let us first brief here the basic concept of impact of jets and after that we will derive the expression of force exerted by a jet of water on a series of vanes. If we see practically, force exerted by a jet of water on a single moving plate will not be feasible. Therefore, we will see the practical case where large number of plates will be mounted on the circumference of a wheel at a fixed distance apart as displayed here in following figure. 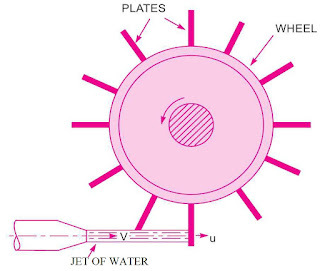 Jet will strike a plate and due to the force exerted by the jet on plate, wheel will be started to move and therefore second plate mounted on the circumference of wheel will be appeared before the jet and jet will again exert the force to the second plate. Therefore, each plate will be appeared successively before the jet and jet will strike each plate or jet will exert force to each plate. Therefore, wheel will be rotated with a constant speed. After striking, jet will move tangential to the plate and therefore velocity component in the direction of motion of plate will be zero. We will see another topic i.e. 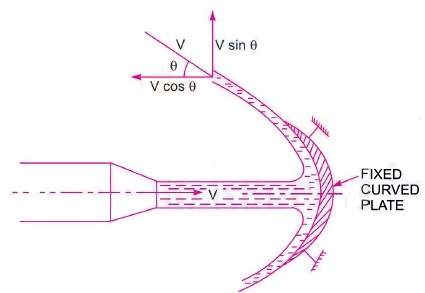 Force exerted on a series of radial curved vanes in the subject of fluid mechanics with the help of our next post. 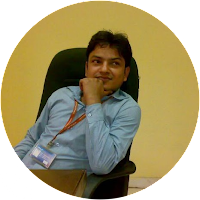 We have already seen the derivation and fundamentals of stagnation properties i.e. stagnation pressure, stagnation temperature and stagnation density for compressible fluid flow in our previous posts. We have also discussed the fundamentals of impact of jets, force exerted by a jet on vertical flat plate, force exerted by a jet on stationary inclined flat plate, force exerted by a jet on stationary curved plate and force exerted by a jet on a hinged plate and in our recent post. Now we will see here the derivation of expression of force exerted by a jet on a curved plate when the plate is moving in the direction of jet with the help of this post. Let us first brief here the basic concept of impact of jets and after that we will derive the expression of force exerted by a jet on a curved plate when the plate is moving in the direction of jet. 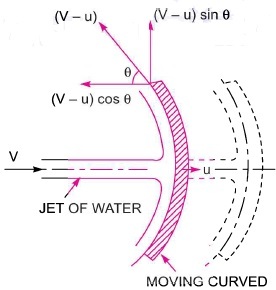 Let us consider a jet of water striking a curved plate at the center of the plate which is moving with a uniform velocity in the direction of jet as displayed here in following figure. Velocity will be resolved into two components. One component will be in the direction of jet and second component will be in the direction perpendicular to the jet. We have taken negative sign as at the outlet, the component will be in the opposite direction of jet. 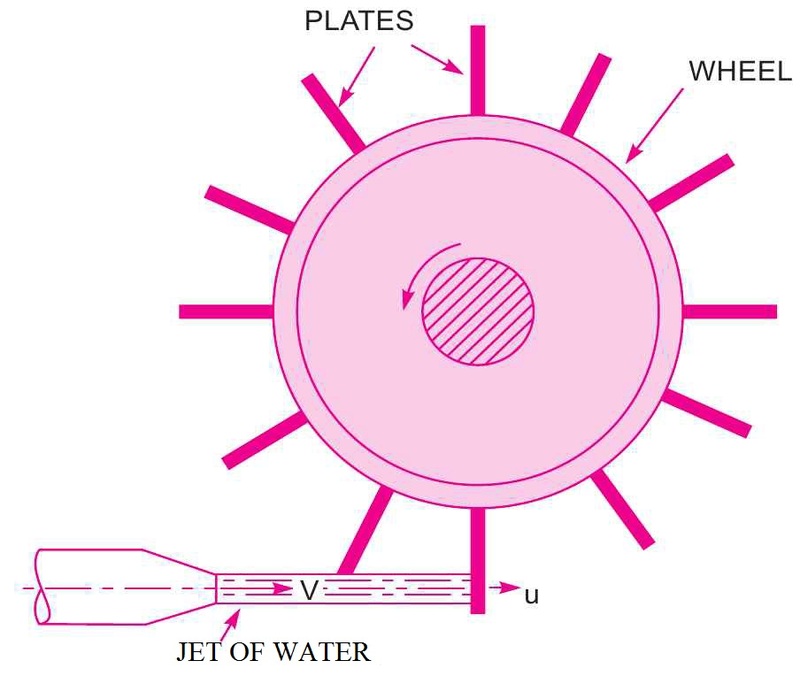 Above equation, derived above, force exerted by the jet of water on the curved plate in the direction of jet and works done by the jet per second on the plate when water jet strikes the curved plate when the plate is moving in the direction of jet. 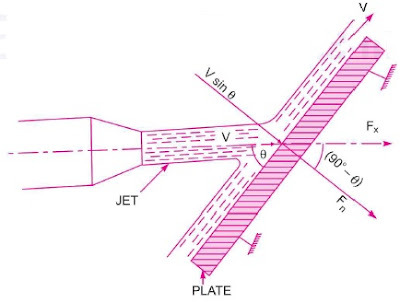 We have also discussed the fundamentals of impact of jets, force exerted by a jet on vertical flat plate, force exerted by a jet on stationary inclined flat plate and force exerted by a jet on stationary curved plate in our recent post. Now we will see here the derivation of expression of force exerted by a jet on a hinged plate with the help of this post. Let us first brief here the basic concept of impact of jets and after that we will derive the expression of force exerted by a jet on hinged plate. Let us consider a jet of water striking a vertical plate at the center which is hinged at point O as displayed here in following figure. When jet of water will strike the plate, the plate will swing through an angle about the hinge as displayed here in following figure. Let us consider the following terms from above figure. Initial position of the vertical plate is displayed above in figure by dotted lines. When water jet will strike the plate, the plate will swing through an angle θ. After the jet strikes the plate, point A will be now at point A’ as displayed in above figure. Weight of plate will be acted through the point A’ after water jet strikes the plate. There will be two forces acting on the plate as mentioned here. Once the jet strikes the plate, for equilibrium condition we will have following equation as mentioned here. 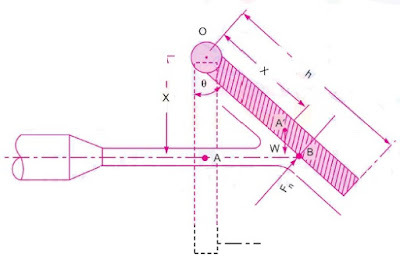 Above equation, derived here, provides the angle of swing of plate when water jet strikes the vertical plate which is fixed at hinge. We have also discussed the fundamentals of impact of jets, force exerted by a jet on vertical flat plate and force exerted by a jet on stationary inclined flat plate in our recent post. 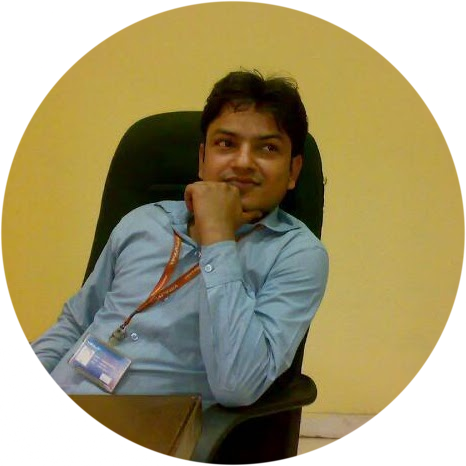 Now we will see here the derivation of expression of force exerted by a jet on stationary curved plate with the help of this post. Let us first brief here the basic concept of impact of jets and after that we will derive the expression of force exerted by a jet on stationary curved plate. We will see here three conditions as mentioned here. First we will see the case of Jet striking the curved plate at the center and we will secure the expression for force exerted by jet. 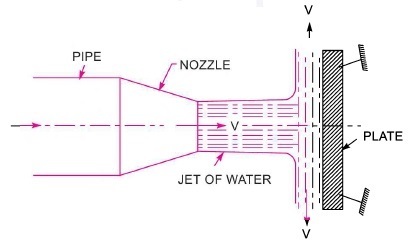 Let us consider that a jet of water strikes a fixed stationary curved plate at its center as displayed here in following figure. Let us assume the following data from above figure. Let us assume that the plate is smooth and there is no loss of energy due to impact of water jet. Water jet, after striking the stationary curved plate, will come with similar velocity in a direction tangentially to the curved plate. We will resolve the velocity at the outlet of curved plate in its two components i.e. in the direction of jet and in a direction perpendicular to the jet. We have taken negative sign because velocity at the outlet is in the opposite direction of the water jet coming out from nozzle. 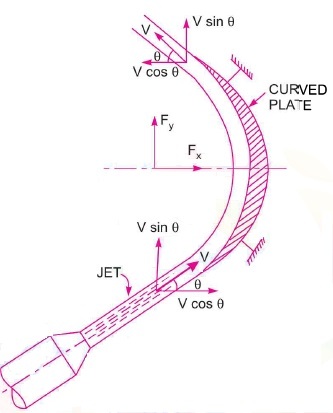 Let us consider that a jet of water strikes a fixed stationary curved plate at its one end tangentially, when the plate is symmetrical, as displayed here in following figure. Let us assume that the plate is smooth and there is no loss of energy due to impact of water jet. Water jet, after striking the stationary curved plate, will come at the outlet tip of the curved plate with similar velocity i.e. V in a direction tangentially to the curved plate. Let us consider that a jet of water strikes a fixed stationary curved plate at its one end tangentially, when the plate is unsymmetrical, as displayed here in following figure. Above equation, derived here, provides the components of force exerted by the liquid jet on the stationary curved plate for above three cases.